"Soldiers Died in the Great War"2 shows that Private Harry Harper joining the Sherwood Foresters like most of his "Old Boys" pals, but was then resident in Coventry, showing almost certainly that he was working at The Humber Cycle Factory, which had moved its premises from Beeston to Coventry in 1907. The 1918 German Spring Offensive or Kaiserschlacht (Kaiser's Battle), also known as the Ludendorff Offensive, was a series of German attacks along the Western Front during World War I, which marked the deepest advance German Spring Offensive, by either side since 1914. The German authorities had realised that their only remaining chance of victory was to defeat the Allies before the overwhelming human and material resources of the United States could be deployed. They also had the advantage of nearly 50 Divisions freed by the Russian surrender (Treaty of Brest-Litovsk). There were four separate German attacks, codenamed Michael, Georgette, Gneisenau, and Blucher-Yorck. They were intended initially to draw forces away from the Channel ports, that were essential for British supply, and then attack the ports and other lines of communication. Operation Michael - On 21 March, 1918, the Germans launched a major offensive against the British Fifth Army and the right wing of the British Third Army. The artillery bombardment began at 4.40 am on 21 March. The bombardment hit targets over an area of 150 square miles, the biggest barrage of the entire war. Over 1,100,000 shells were fired in five hours. Although the British had learned the approximate time and location of the offensive, the weight of the attack and of the preliminary bombardment was an unpleasant surprise. The Germans were also fortunate in that the morning of the attack was foggy, allowing the stormtroopers leading the attack to penetrate deep into the British positions undetected. By the end of the first day the British had lost nearly 20,000 dead and 35,000 wounded, and the Germans had broken through at several points on the front of the British Fifth Army. After two days Fifth Army was in full retreat. As they fell back, many of the isolated "redoubts" were left to be surrounded and overwhelmed by the following German infantry. The right wing of Third Army became separated from the retreating Fifth Army, and also retreated to avoid being outflanked3. It was during this first day, 21st March 19184, that Private Harry Harper was believed killed in action, his name being recorded on the "Memorial to the Missing", Poziers Cemetery, Somme. His next of kin were listed as being living at 79 Regent Street at the time of Harry‘s death. Sergeant Enoch Henry Harper, the Harper family's elder son had been killed the year before on the 5th June 1917. The Poziers Memorial - The village of Pozieres was attacked on 23 July 1916 by the 1st Australian and 48th (South Midland) Divisions, and was taken on the following day. It was lost on 24-25 March 1918, during the great German advance, and recaptured by the 17th Division on the following 24 August. Plot II of Pozieres British Cemetery contains the original burials of 1916, 1917 and 1918, carried out by fighting units and field ambulances. The remaining plots were made after the Armistice when graves were brought in from the battlefields immediately surrounding the cemetery, the majority of them of soldiers who died in the Autumn of 1916, but a few represent the fighting in August 1918. 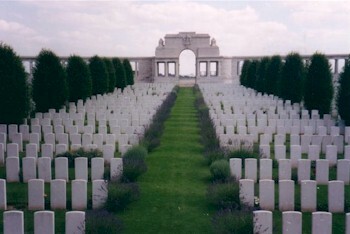 The cemetery is enclosed by the Pozieres Memorial, which relates to the period of crisis in March and April 1918 when the Allied Fifth Army was driven back by overwhelming numbers across the former Somme battlefields, and the months that followed before the Advance to Victory, which began on 8 August 1918. The Memorial commemorates over 14,000 casualties of the United Kingdom and 300 of the South African Forces who have no known grave and who died on the Somme from 21 March to 7 August 1918. The Corps and Regiments most largely represented are The Rifle Brigade with over 600 names, The Durham Light Infantry with approximately 600 names, the Machine Gun Corps with over 500, The Manchester Regiment with approximately 500 and The Royal Horse and Royal Field Artillery with over 400 names. The memorial encloses Poziers British Cemetery Plot II of which contains original burials of 1916, 1917 and 1918, carried out by fighting units and field ambulances. The remaining plots were made after the Armistice when graves were brought in from the battlefields immediately surrounding the cemetery, the majority of them of soldiers who died in the Autumn of 1916 during the latter stages of the Battle of the Somme, but a few represent the fighting in August 1918. T here are now 2,755 Commonwealth servicemen of the First World War buried or commemorated in this cemetery. 1,375 of the burials are unidentified but there are special memorials to 23 casualties known or believed to be buried among them6. 2Published in 1921 by His Majesty's Stationery Office, on behalf of and by authority of the War Office, giving details of those who died during the Great War. In its original form, there was one volume listing nearly 42,000 officers and an additional eighty volumes to list all the "other ranks" who gave their lives. 3Based on the account of Operation Michael at Spring Offensive, http://en.wikipedia.org/w/index.php?title=Spring_Offensive&oldid=317106367 (last visited Sept. 30, 2009). 6Florence Ruth Harper, Harry's sister, had married Percy William Booth in 1910. She died in 1975, aged 90, and is buried with her husband in Beeston Cemetery.